The instructions on this page describe how to export Bamboo data for backup. Bamboo will be unavailable while the backup process completes. The export itself may take a long time to complete, depending on the number of builds and tests. We recommend running your backups at a time of day or night when usage is low. Bamboo will not export if plans are currently being built. User management settings for Bamboo will be saved as part of the export. For information on user management in Bamboo, see Connecting to external user directories. Export Directory Path setting: Bamboo restricts the editing of certain file path settings for security reasons (see Bamboo Security Advisory 2010-05-04). If you must configure Bamboo to permit modification to its file path settings, start Bamboo with the system property bamboo.paths.set.allowed=true. The procedure for configuring a Bamboo system property is described on Starting Bamboo. Edit the default name of the file to which Bamboo will export, if necessary. Clear this to export only the plan configurations. Select to have Bamboo export build artifacts. 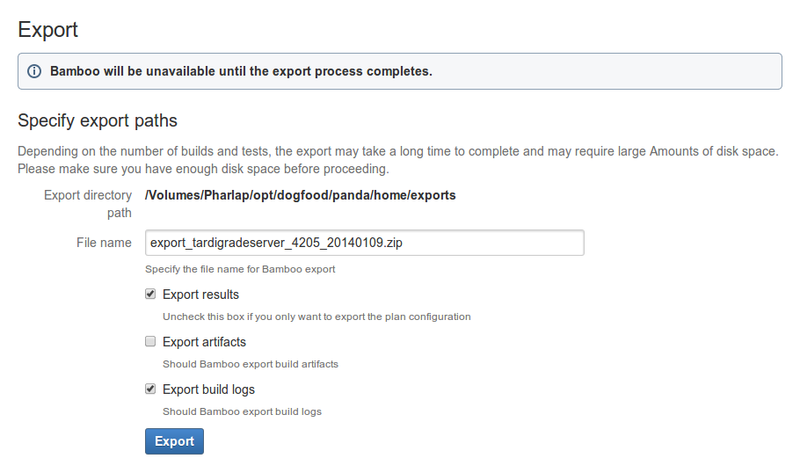 Select to have Bamboo export build logs.